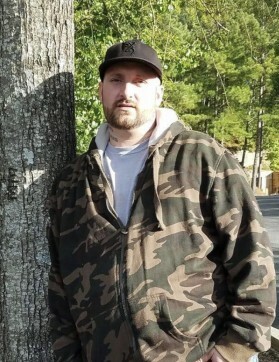 Jody Glenn Johnston, age 34, of Dallas, GA. passed away on Wednesday, March 20, 2019. He was born on October 13, 1984 in Austell, GA. to Joey and Charlene Johnston. Jody was self employed and worked as a tree surgeon. He was a member of Ebenezer Baptist Church. Mr. Johnston was an avid deer hunter and loved anything and everything to do with motorcycles. Any one that knew Jody would tell you he had a heart of gold, and he would give you the shirt off his back without a single hesitation. Jody is loved dearly by his parents, each and every one of his family members and his friends. He is preceded in death by his grandmother, Linda Ledford. Survivors include his loving parents; Joey and Charlene Johnston of Dallas, GA, grandfather, Glenn Ledford, grandmother, Betty Johnston, several loving aunts and uncles, as well as many nieces and nephews. Funeral services for Mr. Johnston will be held on Sunday, March 24, 2019 at 2:00 PM from the Clark Funeral Home Chapel with Pastor Harold Wetherford officiating, and Mr. Randy Birchfield providing the eulogy. Interment will follow the service at Melrose Hills Memorial Park cemetery with the following gentleman serving as pallbearers; Troy Waits, David Birchfield, Charles Ledford, Scott Johnston, Cory Lepire, Jessie Ledford, Matthew Arnold and Randy Birchfield. The family will receive friends at the funeral home on Saturday, March 23, 2019 from 6:00 PM until 9:00 PM. To leave online condolences for the family, please visit our website at www.samclarkfuneralhome.com.